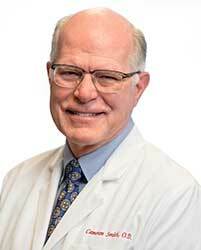 Home » Our Doctors » Cameron E. Smith, O.D. Born and raised in Pasadena, Texas, a Houston suburb, Dr. Cameron Smith attended the University of Houston where he received a Bachelor of Science degree in Electrical Engineering. After graduation, he joined Moeller Electric Corporation, an international manufacturer of electric motor controls. During the next 20 years, Cameron rose from design engineer to regional Marketing Manager, designing complex control systems for use in power generating stations, wind generators, chemical plants, breweries, and food processing plants. Cameron’s passion was solving complex problems. During this same period, Dr. Smith continued to maintain an interest in biology and physiology and was drawn to vision because the physics of optics and electrical waves are quite similar. So, in 1996 at age 42, Cameron left a successful career in engineering and began studies at the University of Houston College of Optometry where – not surprisingly – he was the oldest member of the Doctoral Class of 2000. Following graduation, Dr. Smith completed a 1 year Fellowship in Corneal and Contact Lens research, and co-authored a poster on Dry Eyes after Lasik. From 2001 to 2006, Cameron served as an adjunct faculty member at the UH College of Optometry and was a practicing clinical Optometrist at several private practices in the Houston area. He found that he loved the hands-on clinical environment best, so in 2007, Dr. Smith moved from Houston to Mansfield and opened his own new Texas State Optical practice. He is still solving complex problems, only now in optics instead of electrical circuitry. In his off time, Cameron enjoys boating and jet skiing and relaxes by reading, usually with a cup of warm coffee. An avid history buff, Dr. Smith is recognized for his knowledge of the military aircraft of World Wars I and II.